Today we're bringing you a free project from Boutique Bags by Sue Kim! Hope you enjoy! With their defining gathers, these Gathered Zipper Pouches are a simple set that has an easy process of adding the zippers. The gathers not only add beauty to the pattern but they are practical by giving the pouch more storage room. 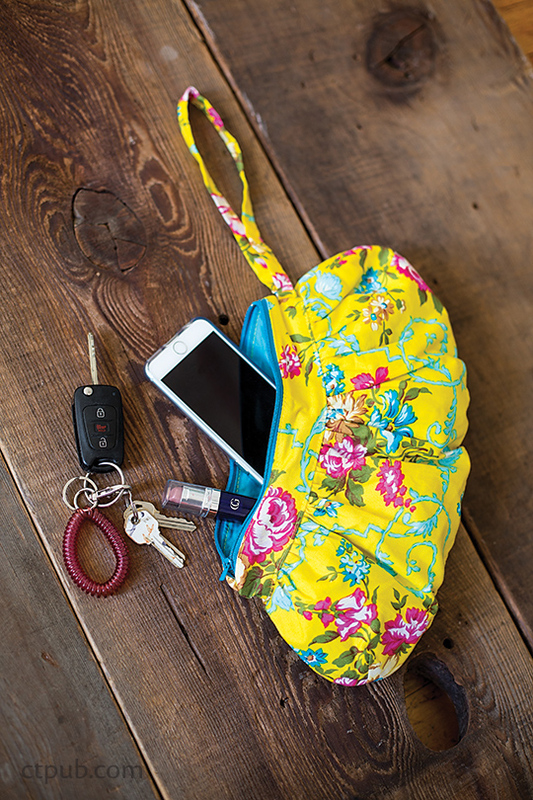 With a few of these pouches inside your purse, you’ll have an organized and convenient carry-around companion! You can also add a loop as a handle for easier carrying. 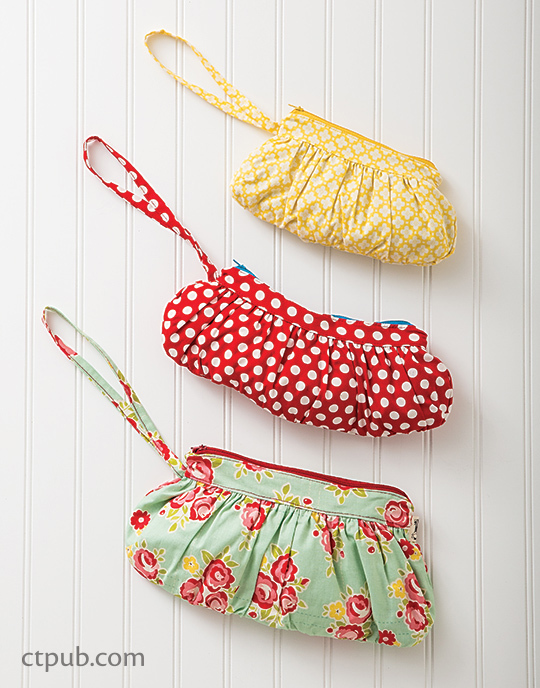 All three pouches can be made with the same fabric or with three different fabrics—the options are endless! This is also the perfect gift set. Amounts are based on 42˝-wide fabric and are for 3 pouches (1 of each size). Note: A 3/8˝ seam allowance is included on the pattern. Backstitch at the beginning and end of each seam. Cut out the exterior, lining, and interfacing pieces as listed below. 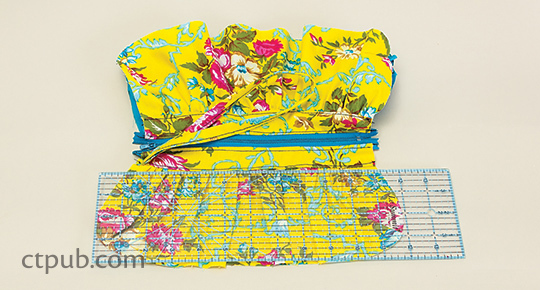 Refer to the Large Pouch Panel diagram to trace and trim the bottom corners all of the Large Pouch panels using the Gathered Zipper Pouches Corner (Large) pattern. Refer to the Medium Pouch Panel diagram to trace and trim the bottom corners of all the Medium Pouch Panels using the Gathered Zipper Pouches Corner Template (Medium) pattern. Refer to the Small Pouch Panel diagram to trace and trim the bottom corners of all the Small Pouch Panels using the Gathered Zipper Pouches Corner (Small) pattern. 1. Fuse the interfacing to the wrong side of the lining pieces. 2. Lay the exterior front piece wrong side up. Fold the dart on the lower corner right sides together, matching the dart lines. Pin and stitch along the dart lines, backstitching at the beginning and end. Press the darts on the front piece toward the center. Stitch the back darts in the same manner, but press the darts on the back piece toward the outside edge. 3. Make the gathers along the straight top edges of the pouch panels. Sew 2 rows of hand or machine basting stitches on the fabric, within the seam allowance, as marked on the pattern. Leave a few inches of thread at each end. 4. Pin at each end of the gathering stitches and wind the threads around the first pin in a figure-eight shape. Gently pull the threads at the other end until the gathered piece has been shortened to match the piece it will be sewn to. 5. Wind these threads around the second pin in the same manner and spread the gathers evenly. 6. Place and pin a pouch panel and a top panel with right sides together. Sew each set of pieces together and press the seams toward the top panel. 7. Topstitch the top panels 1/8˝ from the seam. 8. Repeat Steps 2–7 for the lining pieces. 1. Fold the strap in half lengthwise, wrong sides together, and press to make a crease. 2. Open the strap with the wrong side facing you. Fold in each long side of the strap to the center crease and press. 3. Fold in half again along the first crease,press, and pin. Topstitch 1/8˝ from the double-folded edge. 4. Fold the strap in half. Place and baste it onto the left side edge of the top panel. 1. Close the zipper and lay it on the exterior top panel with right sides together. You will be able to see the wrong side of the zipper. Pin the zipper and panel in place. Stitch the panel and zipper using a zipper foot, sewing 1/4˝ from the zipper coil. Backstitch to secure. 2. 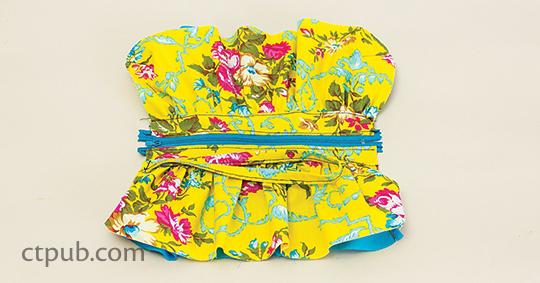 Place the lining piece and exterior with the zipper installed with right sides together. The zipper will now be between the exterior and the lining. 3. Pin and stitch the 3 layers together along the previous stitching line. 4. Flip the lining over to the wrong side and press. Topstitch the top panel close to the seam through all the layers. 5. Repeat Steps 1–4 for the other exterior and lining pieces. 1. Gather each exterior bottom until it is 16˝ wide for large, 15˝ wide for medium, or 12˝ wide for small. 2. Repeat Step 1 for the lining pieces. 3. Match the exteriors with right sides together and then place the lining with right sides together. Open the zipper before you sew all the way around the pouch. It’s very difficult to turn it right side out when the zipper is closed. Pin and sew all around the pouch. Carefully sew over the zipper coils. Leave a 4˝ gap on the bottom of the lining to turn it right side out. 4. Notch the curved seam and clip the zipper panel seams. 5. Turn the pouch right side out through the opening in the lining. Using a turning tool, push out the curved corners. Stitch the opening closed. Press the pouch flat. Search Press are the exclusive distributor for C&T in the UK & Europe, www.searchpress.com.